The Uthmani Khilafah is a golden chapter in the history of Islam. During its 600 years of rule its sphere of influence covered 3 continents: Europe, Asia and Africa. The sum total of the lands which were under Uthmani rule at different times covered an area of almost 23 million square kilometers. The Uthmani Khilafah not only created a balanced Islamic culture in Istanbul and Anatolia, but made invaluable contributions to the Muslim world as a whole. It consolidated the Islamic lands linking the major Islamic cities of Makkah, Madinah, Baghdad, Damascus, Cairo and Istanbul. It also played a huge role in Europe. Much of European history has been shaped by the Uthmani Khilafah and many of the people it won over to Islam remain Muslim till today such as in the Balkan states. In this book, we have tried to present our English-speaking readers with a glimpse of various aspects of the Uthmani Khilafah. 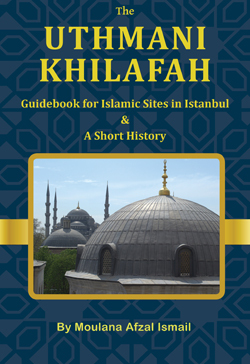 We felt the need to compile a brief work on this topic due to the scarcity of material in English covering the Islamic dimension of the Khilafah. A visitor to the city of Istanbul has much to see and many lessons to learn. It is a city filled with Islamic history. Together with its many historical monuments, museums, libraries, bazars, tombs and public baths, it is a city adorned with domes and minarets of numerous masaajid. The minarets and masaajid give Istanbul its characteristic skyline. Istanbul can rightly be regarded as one of the largest outdoor museums in the world. The book includes more than 30 full colour images.